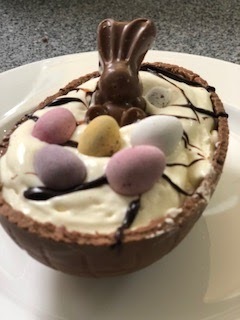 Easter is definitely an excuse/opportunity for some nice baking and desserts - almost any recipe can be improved with the addition of mini eggs! 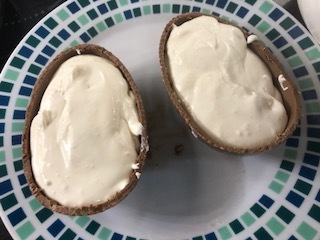 A few days ago I read about a cafe in Wales that was serving cheesecakes made inside Easter egg shells - the article has been circulating on the internet and while I thought it was a great idea, I was almost surprised it hadn’t been done before, as it looks such a simple idea! In fact so simple that it looked pretty easy to make something similar myself, which is exactly what I decided to do. I used a basic no-bake cheesecake recipe keeping the flavour plain, as it has the chocolate shell and I was going to add some decorations on top, but you could easily change the flavour of the cheesecake by adding lemon zest and juice, or butterscotch flavouring, or cocoa powder and/or grated chocolate (I did consider the latter but thought it would be too much chocolate), you could even crush up some Easter egg shells or some maltesers or some mini eggs to the cheesecake mix! 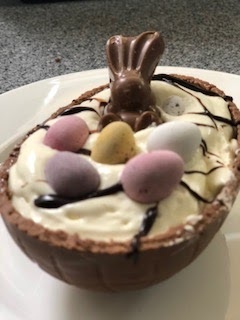 You can also make your own Easter egg shell using a mould, which I have done before, but this time didn’t have that much time so bought a cheap Easter egg and used the shell from that. 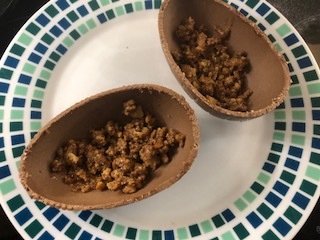 Unwrap the foil from the Easter egg and place the blade of a sharp knife in a cup of hot or boiling water for a few minutes - this will help cut through to separate the shell into two halves without breaking it. Carefully insert the knife on the join around the easter egg and cut it into two halves. Crush the biscuits either in a blender or in a plastic freezer bag with a wooden spoon and put to one side. Melt the butter in a bowl in the microwave or in a small pan over a low heat, and when melted stir in the crushed biscuits. Stand each chocolate egg shell on a plate and spoon half the biscuits into each one. With a hand mixer, whisk the double cream until it forms soft peaks, then beat in the soft cheese and stir in the icing sugar until combined. 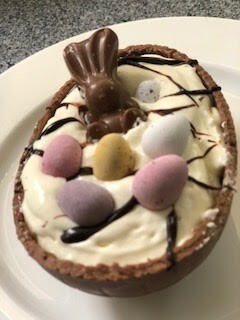 Spoon into the chocolate egg shells and put in the fridge to set. Decorate however you like - I squeezed some Choc Shot in thin lines over the top and added some Cadbury Mini Eggs and a mini Maltesers bunny. 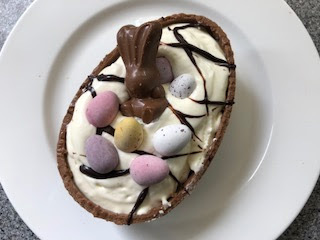 This is a fantastic Easter treat, thank you for bringing it to #CookBlogShare. Happy Easter! Lovely idea - so cute!